Want to rate breweries and earn rewards? Create a FREE account for access to these and other great features. 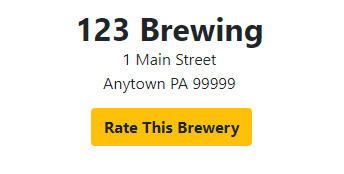 Are you sure you want to delete your last rating of this brewery? When rating, make sure you're actually at the brewery so you earn your badges and entries for free giveaways. You can still rate a brewery if you are off-premises, but it won't earn any badges or entries. Once you've left your rating, head to your profile to check out your badges and rating stats. You can only rate breweries after you create a free account.